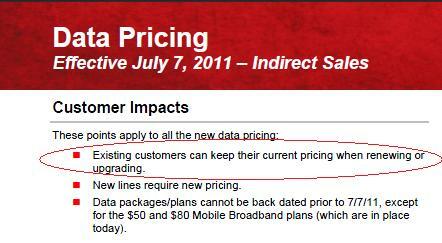 Current Verizon Customers Won’t Ever Be Affected by Tiered Data, Only New Customers and Lines? Yesterday was filled with the not-so-exciting news of tiered data plans that will launch at Verizon Wireless on July 7. The whole day got kicked off when we received an initial pricing tip on how the plans would be structured which was then followed up by an employee email that hit more than a few major tech sites, including ours. And after all of that settled, the executive director of communications for Big Red came out and confirmed that “usage based” plans would indeed be starting next month. It was a wild ride, but we may have some news that will brighten up your day as an existing VZW customer. According to our friends on the inside and that screenshot above (which is unfortunately partially cut off), existing customers may be able to keep their current pricing and data plan when renewing or upgrading as long as they are locked in prior to 7/7. And from what we’ve been told, that’s a forever type of thing – as in, you can upgrade a year from now and still hang out with your best friend, the unlimited data plan. At the same time though, they only gave you one more New Every 2 after it was cancelled, so let’s not get too invested into forever. With that said, we want to make sure you understand that this is for current or contracts that were just signed prior to 7/7. What that means is if you add a smartphone line after that date, it will receive tiered pricing even though your other lines will all remain unlimited. Sound too good to be true? It almost does to us too, but we’ve heard this a couple of times over the last day and a half. File it away as a semi-rumor for now, until we hear something official from Verizon.